I'm out in the Cambodian countryside, walking down a well worn dirt path. Looking down, I spot what looks like a tree root protruding from the dirt. It catches my eye, because unlike dark tree roots, it’s white. That’s when I realize, I'm not looking at a tree root at all. It’s a bone, a human leg bone! Where I’m standing, is in the middle of a killing field. From 1975 – 1978, there were 17,000 people murdered here by the Khmer Rouge. Most were innocent civilians. Everyone has heard of the 'killing fields' due to the movie of the same name, and I'm visiting one for the first time. 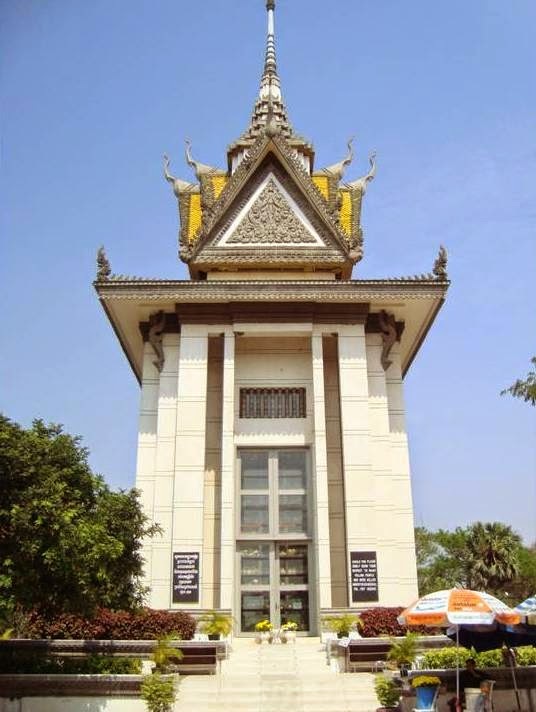 This killing field is known as Choeng Ek, located eight miles south of Phnom Penh. Here is where the guards of Tuol Sleng prison sent all of their victims to be executed and buried. As I walk further along the path, I see dirty pieces of clothing of every color, lying all over the ground. This isn’t discarded garbage, this was clothing of the victims buried here. Like the bones I see, pieces of clothing have gradually been uncovered and surfaced over the years from excavations and erosion. Much of it has been left in place. This is one giant crime scene. Four Buddhist monks pass by on the path, while I look at burial pits to either side of me. Walking between the pits, even more parts of bones are visible protruding from the earth. Here a broken leg bone is sticking out. There is part of a skull. This killing field is made up of numerous mass graves. Pit after pit after pit, the shocking total is 129 mass graves in all. To bear witness to the atrocities committed here, signs were posted on the site. Those beneath two nearby thatched roof enclosures, need no further explanation. This killing field isn’t exactly a field, as some trees are scattered throughout. I come to a large tree, with a stack of leg and arm bones piled up at its base. Apparently, human bones are occasionally gathered up, and placed into piles at locations around the site. A sign next to the tree says, “MAGIC TREE…THE TREE WAS USED AS A TOOL TO HANG A LOUDSPEAKER WHICH MAKE SOUND LOUDER TO AVOID THE MOANB OF VICTIMS WHILE THEY WERE BEING EXECUTED”. Just how did they get ‘Magic Tree’, out of something so horrible? Children were killed here. Other bones at right. The Khmer Rouge didn’t have the money, or the know how to make gas chambers and crematoriums like the Nazis did. So they brought their victims here, to what used to be an old cemetery. The Khmer Rouge wanted to save money on bullets, so few were shot here. Most of their victims here were beaten to death, or stabbed. Their tools of death included steel rods, bamboo poles, axes, hoes, shovels, and knives. Another large, leaning tree, with another pile of bones at it’s base, has a sign that is even more disturbing. 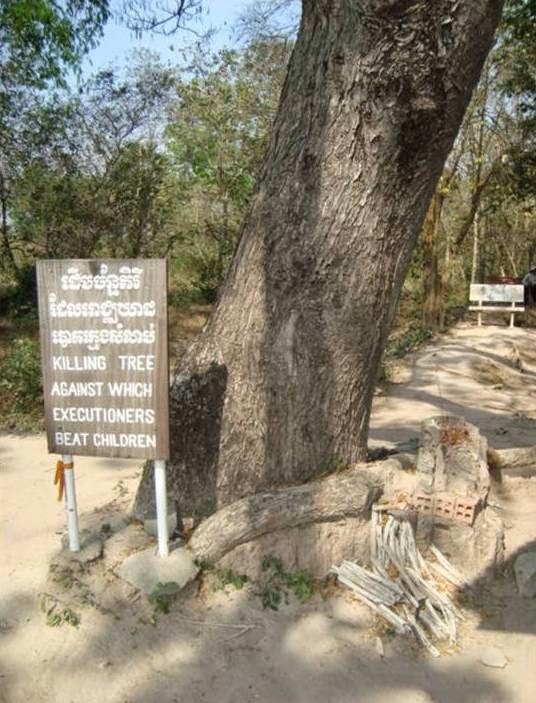 “KILLING TREE AGAINST WHICH EXECUTIONERS BEAT CHILDREN”. In the first year of the genocide, it was mostly the civilians with ‘soft hands’ that were executed here. That meant that the victims were non-farmers, such as teachers, businessmen, white collar workers, and the educated class. There are a few westerners buried here as well, and foreigners that were married to Cambodians. By the final year of killing here, there were no more enemies from the old regime left to execute. By that time, the Khmer Rouge were killing their own. Their paranoia and violence had been turned on each other. In a Cambodian version of the Red Terror, communists turned on communists, making false accusations to turn in political rivals. This is when the more Vietnamese oriented Eastern Zone of Cambodia became the number one target of the Khmer Rouge. Many cadres and soldiers from that region ended up buried here. The current Prime Minister Hun Sen, was a Khmer Rouge cadre from that area. The only reason he wasn't killed by his comrades, was because he managed to escape and flee to Vietnam. Another twisted modus operandi of the Khmer Rouge, was their extensive use of child soldiers. That method was used here, as many of the executioners at Choeng Ek were only teenagers! As Pol Pot sought to 'purify' Cambodia, he had many executioners that were between 13 to 19 years old. Photos of Tuol Sleng victims buried at Choeng Ek. Those killed here include women and children. On some days, more than 300 people were murdered at this site. Killing here was like a factory, and most victims were killed by hand. The executioners killed not just men, but also women and children. The mental and emotional trauma of murdering so many people by hand was more than many of the executioners could handle. Over time, many of them could just not deal with the horror of their actions. Some went crazy, rebelled, or deserted, only to be caught and returned. In an ironic end for them, those executioners who tried to escape, were brought back to be killed in this very place, where they themselves had killed others. (This had also happened to some of torturers at Tuol Sleng prison.) Still others were faithful communists doing their duty to the end, but were betrayed by other cadres, falsely accused, and executed. After the fall of the Khmer Rouge, the Vietnamese led government began excavations here in 1980. Of the 129 mass graves here, 86 were excavated. The diggers found heads were often buried separately, so they were unable to match heads to their original bodies. The pits were dug deep, corpses were usually crammed together, with bodies stacked high. They dug up more than 8,900 corpses, before finally halting the excavations. I’m aware that as I tread lightly around the paths of this killing field, directly beneath my feet are the remains of thousands of more victims, still interred where they were originally buried. As time has passed, some signs of life have returned to this somber place. Birds are chirping in the trees, and an occasional butterfly floats by. Free range chickens peck at the dirt. Goats and cows chew on grass beyond the border fence. Since they didn't excavate all of the mass graves, the cows are probably grazing right on top of them. A tragic fact, is that this is only one of the many killing fields across in Cambodia. A survey done after the war, found that there are at least 389 mass graves across the country. Choeng Ek has few surviving buildings. The old Khmer Rouge office, detention building, and sheds were torn down by scavengers long ago. But there is one tall building; a memorial stupa built in 1988. I approach the structure apprehensively, knowing what's inside. (I saw a similar stupa for Vietnamese massacred by the Khmer Rouge, across the border in Vietnam.) From a distance, it looks only like a whitish tower with windows. The familiar sloping Khmer rooftop with heads of snake-like nagas point up from the corners. As I get closer, I see what is behind the windows. Skulls. Layers and layers of human skulls, with shelves reaching higher and higher. There have to be thousands of human skulls here. Surprisingly, the door isn't locked. My guide opens it, and gestures me to enter. I slowly step inside. Solo flute music floats down from somewhere. The stupa has 17 levels to symbolize April 17th, the day that Khmer Rouge rule began in 1975. I walk around the interior looking at them, level after level, skull after skull. They all stare right back at me, with their dark empty eyes. I remember all those enlarged photos of the faces of condemned prisoners back in the Tuol Sleng prison; they ended up executed here. I look at all of these skulls lined up together, staring back at me. These aren’t just pictures on a wall any more. These are the genuine faces of death. The question comes to me, that comes to all visitors who see this. Why? Why? It’s a question no civilized person can answer. It’s answered only in the twisted logic, the barbarity, the insanity that made up the murderous mindset of the Khmer Rouge communists. Exiting the tower, on steps next to the stupa, I encounter a steel rod, with leg irons looped through it. If prisoners arriving on Chinese trucks got here too late at night for executions, these leg irons were put over their ankles. The condemned were all forced to lie in a row, shackled to the same steel rod. There are enough leg irons here to shackle six people together. Some of the leg irons here look too small to fit around an adult’s ankle. My guide says that in that case, the guards would break the prisoner’s ankle, to make it fit. Choeng Ek has its greatest number of annual visitors on May 20th, the local Memorial Day, when many Khmers who lost relatives here come to remember them. My guide says he's been here then, and that many seniors cry. One of the signs I read as I’m about to leave, gives the best description I’ve seen yet of the Khmer Rouge leaders.